If you were unfamiliar with Alan Bennett, and his Untold Stories happened to be the first thing of his you read, you might find yourself wondering: who exactly is this man? You might well be confused when Bennett wittily reveals himself variously as an egalitarian and a snob, a traditionalist and an iconoclast, a republican and a monarchist, a constitutional solitary and solipsist, a confidant of his many friends and a wholesale entertainer to boot. The more seasoned reader of Bennett will know that he is a man of hugely various and often contradictory facets, many of which he poignantly reveals here, his first collection of autobiographical writings in more than ten years. Not that this is a self-portrait, warts and all, or a Maoist exercise in self-criticism. The only excrescence he writes about is the cancerous polyp, the size of ‘an average rock-bun’, he was diagnosed with in 1997, and which was successfully removed. Bennett does not present himself as someone he is not, nor, forgetting what it was he wrote about himself a hundred pages earlier, go on to contradict himself, in so doing inadvertently allowing the mask to slip. This is not the case at all. Those facets he is happy to reveal constitute a portrait of the man in all his wonderful variety, a phrase he would certainly take exception to, largely on account of his native shyness and congenital modesty, but one which, on greater reflection, he would be likely to concede was not entirely inaccurate. It is the unaffected honesty of his introspections that makes him so engaging, endearing and entertaining. Bennett’s collection, or ‘compendium’, as he would prefer to describe it, is arranged in eight sections: ‘if I have a model book it is not Jane Austen or Dickens or Evelyn Waugh; it is one of those long-forgotten annuals which lured you on from story to story through pictures and puzzles, a real box of delights. And it is my memories of such volumes that reconcile me to the seemingly scrappy nature of this one.’ Such self-deprecation, so much part of his stock-in-trade, is also part of Bennett’s northern legacy, which lies at the core of all his writing. Though long translated south, by way of Cambridge and Oxford – he has lived in Camden for nearly forty years – his roots still show. He has made it his calling to make them show. The first three sections of the book, Bennett devotes to his northern upbringing: loving, but not uncritical, reminiscences of ‘Mam and Dad’, his Aunty Kathleen, his Aunty Myra; ‘writing about them, I feel a twinge of snobbish regret that they were invariably called Aunty, and never Aunt … we did have one aunt, though, Aunt Eveline, and she was preserved from diminishment into Aunty by … her demeanour, which was imposing, and by her build, which was stout.’ With typical northern understatement, Bennett admits that all these family members have ‘crept into one or two’ of his plays. Despite his best efforts to make them so, his reminiscences of family and of his early years are never dull. Often they are highly amusing; in places slightly awkward and embarrassed, and on occasion disapproving; but mostly they are poignant. Pathos is never far from his descriptions of these times. While privileging the reader with these windows onto the life of his family, Bennett always saves his loved ones from becoming objects of mere pity, and he confers on them something approaching a kind of nobility. For some years now, round about Christmas time, Bennett has published in the London Review of Books extracts from his diary for the preceding year. In Untold Stories, we have a bumper offering from the years 1996 to 2004. (The year of Bennett’s cancer was 1997, and he has reserved most of his diary entries for that year for the later essay, ‘An Average Rock Bun’.) 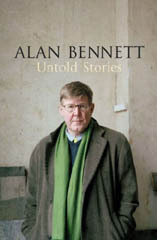 Bennett dismisses these entries as ‘pretty uninformative, not to say cagey’, but he does acknowledge that his diary is a ‘comfort’, and feels better for ‘having written it down.’ He notes, ‘my diary is often best when written in the intervals of other writing; it’s a turning away, a place for asides.’ These asides are as varied as the man himself, and range from anecdotes, jokes and bons mots, to swipes at politicians (in the main), and at Rupert Murdoch. Bennett pours his hot-flowing wit over: Stephen Fry, ClassicFM, mobile phone-users, the last months of the Major administration, the hysteria over the death of Princess Diana, that ‘coward’ Dr John Reid, Norman Tebbit, John Bayley, ‘whose efforts on behalf of his late wife and her reputation make Max Clifford seem timid and retiring’, Clarissa Dickson Wright, and Margaret Thatcher, whose father ‘was thought to be in the black market’ and who, as a child in Grantham, was said ‘to hang out of her bedroom window and spit on the other children’. Kind words he has, however, for Isaiah Berlin (whom he never met, but is nevertheless well-disposed towards), Maggie Smith, Nigel Slater’s Toast, Alan Bates, Alec Guinness, and many others, as well as for his beloved English country churches. Other sections in this book include essays and thoughts on his own plays and other British institutions, namely ‘Radio and TV’ and dear old Thora Hird; and pieces about his own trials and tribulations, ‘Ups and Downs.’ One particularly revealing essay in the section devoted to ‘Art, Architecture and Authors’ is Bennett’s little tribute to the neglected English writer Denton Welch. This is all vintage stuff. It makes the seasoned reader wonder, was there ever a time when Bennett’s writing was not vintage?